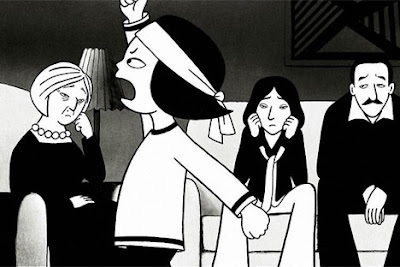 Persepolis was a very 00s film for several reasons. Firstly, it was very strong, graphically speaking. Whatever its other aesthetic flaws, the decade has produced a great penchant for the powers of design...see the iPod and Wes Anderson for further examples. Of course, this graphic sense is no surprise, given that Persepolis is based on a graphic novel. And that's another reason it's so at home in the world circa 2007...comic books have never been hotter in mainstream cinema, and correspondingly, graphic novels could be the next big development in art films (which have been leaving the drab indie aesthetic of the 90s for something more chic). Like Waltz with Bashir (which began life as an animated film rather than a graphic novel, but whose aesthetic appears to be closer to the latter than the usual former), Persepolis uses the graphic form to tackle a culture and hence an "issue" close in spirit to the present day. In Bashir, it's the Israeli war in Lebanon, relevant again for obvious reasons, while Persepolis takes us to Iran which, aside from Pakistan and the countries in which America is at war (which just so happen to border Iran), is the nation most in the news these days. Not that there are any nukes in Persepolis - its concerns are more mundane, and hence more approachable, which seems to be the idea. In introducing us to Iran through the eyes of a little girl as she grows up, Persepolis belongs to another, much older tradition: the coming-of-age tale set against a time of cultural transition. Marjane, our heroine, is just a spunky kid when the Shah's regime is teetering in the seventies. She loves Bruce Lee, idolizes and romanticizes her communist relatives (without really knowing what they stand for), and has a penchant for getting into trouble. In other words, she's a normal tomboy. That Marjane's experiences are so universal in their broad contours - energetic childhood, heartbreak in love, teenage rebellion, attempts at reconciliation with the past, troubled first marriage - serves both to help Western audiences (for whom the film is largely intended) identify with her, and also to throw the elements of her life which are unconventional - revolution, war, exile - into sharp relief. Curiously, given the film's focus on Iran and its marketing image as a modern peek behind the veil, its strongest moments as a narrative are when Marjane leaves her country and struggles to survive in 80s Vienna. In part this may be because the plot finds itself a hook (whereas before it tended to lurch from scene to scene in an episodic, not entirely satisfying structure), and in part it could be that Marjane herself is allowed to shine as a character, no longer overshadowed by Iranian history and current affairs. The film becomes less diligent about introducing its audience to important national events, and instead allows itself to become completely preoccupied with the adolescent troubles of its protagonist. Of course, what's come before strengthens this section, turning it from a conventional if entertaining woe-is-me study of adolescent angst into something stronger and more compelling: a young girl simultaneously forced to suffer through the growing pangs of puberty, homesickness, and guilt over avoiding the war-torn fate of her relatives. That Marjane's reactions do not fit the stereotypical hierarchy of what's supposed to be important (as she wryly observes, she survives revolution and war only to nearly die from a banal love story) lends this section a refreshing honesty. Eventually, Marjane returns to Iran and leads a somewhat muddled life - lurching from parties to marriage, from outspokenness to apoliticization. Eventually, a friend is killed during a police raid on a party, Marjane gets a divorce, and she leaves the country for good, resettling in Paris. The film does not show us anything of her life there, but this has been a coming-of-age story, and it's already hit all the necessary notes. This is not to say that Marjane is "all grown up" at film's end - one of the nice things about the movie is that she still seems unfinished, as perhaps we all are even when we're supposed to have figured everything out. The style and pull of the storytelling subtly echoes the various stages in Marjane's life. The childhood fragments are just that, fragments, composed of half-remembered incidents, half-imagined images, and overheard adult anecdotes which are hard to understand completely. The return and imprisonment of Marjane's communist uncle provides a loose story thread here but mostly, the scenes collect without cohering. As I've indicated, the period in Vienna is the strongest narratively, appropriately enough for the passage through adolescence, a time of chaotic focus, in which the world takes on an intensity and a vibrancy it will not duplicate before or after. And the later scenes in Iran capture the confusion of young adulthood, powered by the forward momentum of what came before but without a real rudder of its own. Though now Marjane's character is stronger and more focalized in the action, the scenes once again appear rather random and the storytelling becomes sketchier (for example, we never really get to know Marjane's husband). I would recommend Persepolis, for its appealing visuals, its look behind the Persian curtain, and its interest as a memoir (all three come together in the image of a little girl with a headscarf wearing Nike sneakers and a jacket with the words "Punk is Not Ded" scrawled on the back). While not a great movie, and not always emotionally engaging, it is never boring and never less than compelling. Besides, its ups and downs, clarities and confusions reflect the life of its heroine, and perhaps many of our lives as well - and for this, the sketchiness of certain passages may indeed be appropriate. The story PERSEPOLIS tells is actually spread over a pair of graphic novels. I've read one of the two. Comparing what I read to what I saw on the screen, I was actually impressed with how much more fluid the story becomes. In the book, while the story is good, the panels seema little stiff. In the film I thought the art work had a lot more energy. I'm right with you in reccomending this film - it's actually one of my favorite g-novel adaptations. Interesting - I just started reading Persepolis (the graphic novel today). You are right that the animation is much more fluid than the panels - and that the storytelling flows a little more. But I'm not sure if it flows enough - by trying to turn it into more of a streamlined narrative did they lose some of the ingenuity and lightness that the comic presents (which creates such an interesting juxtaposition with the darkness of the subject matter) while still remaining bound by the episodic nature of the plot? Of course, this is just based on my observations after a few pages of Persepolis, so further reading could perhaps show me something different. But it is interesting that the movie seems more "visual" than the comic book, which (as a lot of current comic-book/comic-strip art seems to) has a lot of text. Thanks for stopping by - if I continue to read the graphic novel and it changes my thinking on the matter substantially, I may put up another post on Persepolis, comics and the perils of adaptation - a subject which always fascinates me (hence the upcoming Wind in the Willows series). ... that was a long prelude to a comment. I really would like to see this. An interesting point that you make is that this is a animated film that came from a graphic novel. Usualy comic/graphic novel stuff goes to live action filming. And it is also curious why art films HAVEN'T really tapped this area or adaptation. I guess Ghost World and Art School Confidential kinda fall into that category, but it would be interesting to see some others... especially ones that aren't quite so obvious. You're right, Fox. Though I'm not really an avid reader of the form, I've discovered some fascinating graphic novels just by browsing in bookstores. They seem like they'd offer some very compelling material for art or independent films. I think we may see this become a trend in the future. I also see graphic novels as tapping into that high art/low art, fun/thought-provoking territory that used to belong to the cinema, but in which the seventh art hasn't been seen much these days. I can't really say that more graphic novel adaptations would help movies find their way back into the sunlight, because I suspect change has to come within (albeit with outside inspirations) but it could be a start.